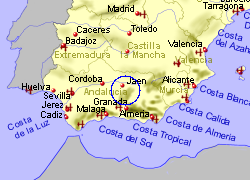 Lying 20km south west of the city of Jaen, the large town of Martos sits at around 700m above sea level, and wraps around 2 sides of the rock of Martos, which rises to almost 1000m. 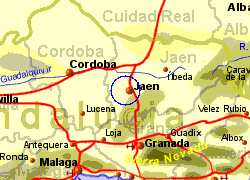 The town, which is an important town in Jaen province, has been built on the strength of the agriculture in the surrounding area, particularly olive growing. From the town, olive groves appear to stretch to the horizon in most directions. The old part of the town has narrow streets and many imposing houses dating as far back as the 15th century. 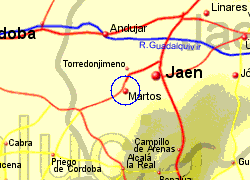 Map of the Martos area.